Join NSBE DC Professionals for our first Professional Development (PD) Seminar for the 2014-2015 year! The purpose of this event is to provide a peer review session to improve members' resumes and discuss best practices for interviewing. This PD series will also prepare members for the upcoming Professional Corporate Mixer in November. Cathy is a certified Global Career Development Facilitator based in the Greater DC Metropolitan area serving clients nationwide. She is also a Career Coach at American Public University System and an active creative content writer with works featured on OnlineCareerTips.com, DCjobs.com, and TheCareerists.com. To check out more information about our speaker and Rezume Forward Career Consulting, please go here. 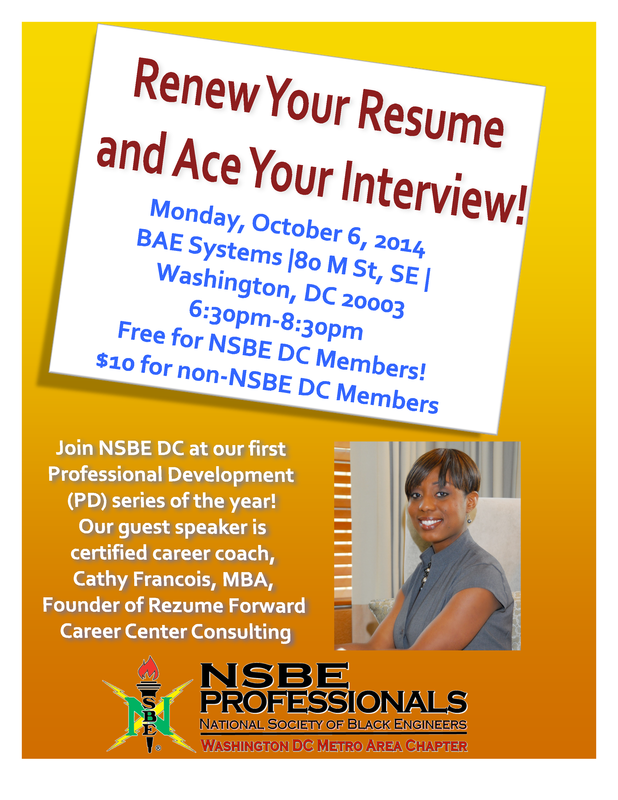 NSBE DC Professionals Members: Free!